No-one will ever know what made him do it. Teddy Sheean was part of the evacuation of his warship, the corvette Armidale sinking fast while around it swarmed Japanese aircraft, shooting with abandon. Teddy turned back to his gun, an Oerlikon 20mm anti-aircraft cannon with a broad leather strap to secure the gunner. He began firing...a courageous Tasmanian was determined to do his best to save his mates and his ship. No member of the Royal Australian Navy has ever been awarded a Victoria Cross. Of the 100 so far given to Australians, 96 are to the Army and four to the Royal Australian Air Force. It derives from substantial unfairness. In World War I and II, the RAN had to apply through Britain’s class-bound Royal Navy for any such award to be made. 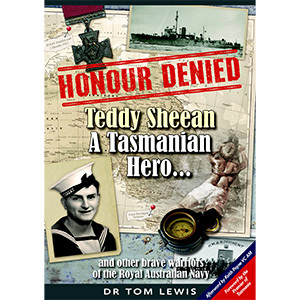 This book focuses on a naval sailor who should have received a VC.